** A current valid PASSPORT is required on the day of travel. Where else but in Europe can you visit three countries in one day? Three different countries, three distinctly different atmospheres, stunning drives, and breathaking scenery. Depart from a centrally located pickup point in Barcelona and relax during the scenic journey to Bagà in a comfortable, air-conditioned minivan. Marvel at the majestic perimeter of rocky peaks in the Cadi-Moixeró National Park as you arrive in Bagà. As this sleepy villages comes to life, you can get a fresh pastry or sandwich in the local bakery, and a coffee in one of the many typical cafes, before rejoining your guide who will give you a short walking tour of the village before leaving you some free time to explore alone. From Bagà, you will head deeper into the countryside as we drive towards the French border. Your next stop is the charming and beautiful ancient spa town of Ax-Les-Thermes. Your guide will recommend some of the best natural fountains to visit, and those best suitable for soaking your feet in. You'll then have free time to enjoy the healing waters, browse the local artisan shops where you can buy local cheeses and cured meats, as well as looking out for a souvenir to remember your visit. After an hour of wandering around this typical French village, its time to choose from one of the many local restaurants for a traditional French lunch. 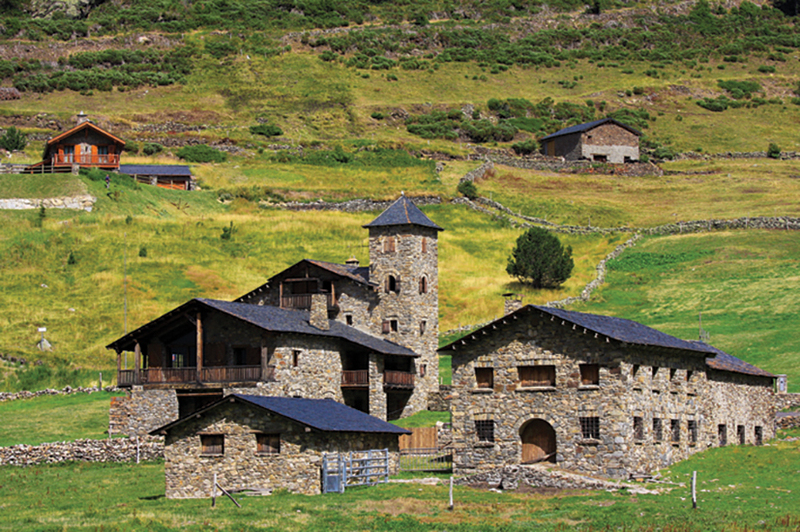 After a memorable French experience, you will meet back at the bus to head towards Andorra. Your route takes you through the beautiful Pyrenees Alps to Andorra la Vella, the capital of the small but stunning country of Andorra. On your way we will cross the Pas de la Casa, an amazing high mountain pass with some stunning photo opportunities. As you descend into Andorra you will stop off at a typical mountain valley where you will get a glimpse of how Andorra used to be. Tiny stone huts dot the mountainside, a Roman church stands guard as it has done for centuries, and the wind and the water are the only sounds you'll hear. There will be a chance for you to enjoy a brief hike to get away from it all. From here you will head down the valleys into Andorra de la Vella. This will be your last stop of the day, but you'll have enough time to do a little bit of duty free shopping, and grab a quick bargain. At about 4pm, you will return to the bus and head back to Barcelona via a different route. This drive takes you through dramatic gorges, past verdant farming land, and alongside lakes and rivers, before the landscape levels out and the lush tones of green of the fields and the shining grey of the mountain rocks are replaced by the dusty orange and brown hues of this arid landscape. You will stop en route for a chance to stretch your legs and quench your thirst, before arriving back in town at about 7.30pm. There is no denying that this tour takes in a lot of driving, but every mile brings a new view, every turn a different perspective. And where else in the world can you visit three countries in just one day.